A completely new category of long lasting acoustic strings that last up to 4X longer than ordinary acoustic strings, according to Stefan Grossman. a renowned concert artist, educator, and owner of The Guitar Workshop Catalog. 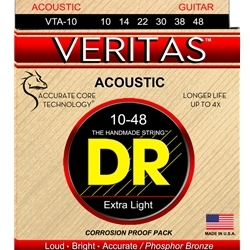 Accurate Core Technology™ (ACT™) is at the heart of VERITAS™ strings. Superior core wire is recognized as the foundation for rich tone, accuracy of intonation, and durability. Accurate Core Technology™ was developed to reinforce the core wire and fill in imperfections along the entire length of the core wire. In our opinion, this results in strings with improved pitch retention, and stability.